Emerging and experienced film makers from Africa at large and all over the world are invited to submit their films for screening in our 2nd annual festival event taking place in September 2014. All genres are welcome but the festival encourages action films/ dramas, thriller, science fiction feature/ short films. Calls opened on the 15th of February and closes on the 25th May 2014. This is the first festival in South Africa that will go beyond artistic films, by accommodating all kind of genres i.e. action, sci-fi etc. We believe that emerging and experienced film makers deserved equal rights to showcase their talent. Therefore, this festival is initiated as a platform to give new film makers from KZN, Africa, and all over the world a chance to showcase their films worldwide, while promoting the work of the experienced film makers. Using the existing relationship between Sollywood Films and major US studios, the festival will organize experienced film makers, A-list actors and actresses from Hollywood, Bollywood, and Europe to provide seminars for local artists / film makers interested to make it big in the industry. FREE Screenings and Seminars will be held in the best locations in South Coast namely: Capenta Bay Hotel, Margate Hotel, Oribi Gorge Hotel, and Wild Coast Sun Casino and nearest location (Gamalakhe). This film festival started on the 23rd of September 2013 and will be running annually,from the 21st to 23rd of September. There will be three exclusive workshops to be held for the duration of this event (Action Directing and Stunt Coordination, Producing and Directing, and Special Effects workshops). The Action Directing and Stunt Coordinating Workshop will be hosted by Steven Lambert, a Hollywood veteran action director, choreographer, stunt coordinator, and actor with more than 30 years experience in the industry. Priority will be given to film makers who submitted their films for screening in the festival to enter these workshops. Other candidates interested to attend must either have written a script with relevant elements, or actor/actress interested to be an action actor, or Editor or Producer interested to make such films in future. Submitting your film will automatically qualify you to attend these exclusive workshops hosted by the best in the industry. He is known for 'The One' starring Jet LI, 'The Quest' starring Jean Claude van Damme, 'Oceans 12' starring Brat Pitt, 'The Negotiator' starring Samuel L Jackson , 'The Specialist' starring Sylvester Stallone, 'Delta Force 2' starring Chuck Norris, 'Total Recall' starring Arnold Schwarzenegger among other. To find out more about him you can go to his IMDb page by clicking here. Driven with passion to pass his wisdom to the younger generation, Steve, will be hosting workshops on Stunt Coordinating and Action Directing in Johannesburg, Cape Town and Durban in September of 2014. He will share his practical knowledge about action acting, how to take bullet hits, six things to be a good stunt person (timing, co-ordinating, distance focus, power and mind), safety when dealing with action, how to use lenses, harness cables, hit cars, breaking down action in a script, stunt doubling, five different styles of fights, etc. 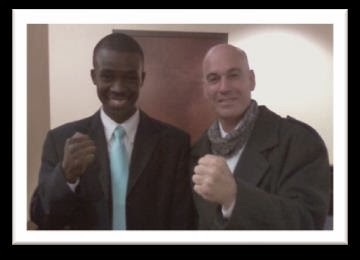 Steven Lambert met with local filmmaker and founder of Sollywood Films, Senzo Zindela, in New Orleans, USA, in February 2011. Since then, they started to work on the creation of African action films. Rubbing shoulders and attending a workshop hosted by him, will definitely make a big difference in African cinema, this workshop must not be missed! Email us at ugufilmfestival@gmail.com, or call us at +27 71 098 5661.